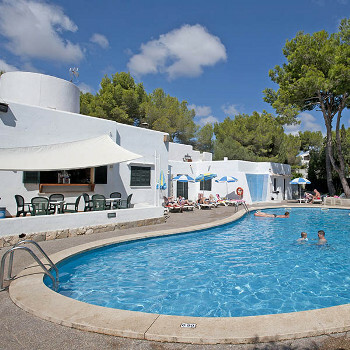 Situated in the heart of Cala dOr, this attractive complex has an informal atmosphere and is especially popular with British families and couples. About what you would expect for a two star accommodation. Staff were friendly and helpful mostly. Had to ask to change apartment and they did this with no fuss which was nice. Although self catering it would have been hard to cook as kitchen virtually non existent. Everything is extra including a kettle and toaster, security box and air conditioning. When we left I gave back the key and just received a grunt in reply! No goodbye or anything but I think that was just that one person as the others were all nice. Hotel tip: High floor needed to avoid the cockroaches. We recently came back from this so called 2 star accommodation (before other people start saying you get what you paid for!!!). We have been 2 stars before but this was something else!!! Day 1 we were given room 209.This was because a Spanish family had spent a night there and decided that they didn't like it. I think that it might have had something to do with a giant cockroach which was going between the bathroom and under the fridge. Needless to say we didn't unpack anything and demanded to be moved. We were told that room e5 was worse than room 209. This didn't inspire me with confidence. Room e5 was smaller and darker with a view of other apartments and some very dead bushes. But we decided to take it. Just when we thought that it couldn't get any worse, well it did. The cooker did not work. Reception sent a man with a spanner that banged the cooker a few times and blew on it. Eventually he got two out of three rings working, well two out of three isn’t bad. The next day though, we ran out of calor gas. We did however manage to hire a toaster. But was told that there were no kettles available. We then had to boil a pan instead. There were no TVs either in the rooms as advertised on the website. This was very misleading, but that was the least of our problems. About day 3 or 4, the toilet decided to break and even though you could flush it, it just kept filling up and gurgling all night. So then it was back to reception again. This happened twice and after threatening them to move us again. They sent another man with a spanner, but this man was a little more qualified than the last man and put new parts in the cistern. On the plus side the pool area and entertainment was excellent. Apart from there being no sunbeds after 8am in the morning. The food at the pool area was great and reasonably priced. If it wasn't for that I think that we would have come back to England early. As it was we were counting down the days and we even had people wishing that it was them going home and not us.... We were not the only ones unhappy. We spoke to people that had moved three times. We stayed for 10 days and were glad that it wasn't 14. Room Tip: don’t go avoid is my best tip! We originally booked the Sol Cala Dor but on arrival this accomodation was not availsble.The agents having been informed prior to or booking! We were in 4 apartments her over 3 nights the place was insecure,unclean,insanitary and unsafe.There were bare wires, bad plumbing, loose masonery and some windows had loose glass in thw widow frame. Self catering facilities were terrible even the can opener could not be used. The accomodation was so bad that we found other accomodation and left 4 days early. We compained to the Mallorca tourist board andhave raised our Clim in The County Court. My advice is to avoid at all costs. Well, the room we stayed in and reports from other guests was that it was not fit for self catering, dirty rusty fridge, worktops non existent and cupboards falling apart. Apartment was not clean and infact was infested with ants and wardrobe was filthy. Hotel staff were not friendly or helpful. Arrived at 10.30pm with heavy luggage only 1 reception staff working and not even offered to assist to our apartment,but did give us a map!! To sum up Faulty Towers would have been much more of a welcome(come back Basil Faulty all is forgiven). Did not use pool as having monitored hygiene it should have been condemned. Entertainment was quiet frankly non existent. Would I visit this holiday camp again? I think counselling or hypnotherapy would not make me go back to it again!! However the best thing about this establishment was the day we were leaving. Having booked with Travel Republic, flights were great, hotel hoppa was excellent and then the bad bit of the holiday. We arrived at the apartments, dad wasn't best pleased with the location as you are very close to the town centre, but the rest of us all were happy. Was told on arrival that the hotel was overbooked and the best they could offer was to put all 6 of us, 4 adults and 2 children into a 1 bedroom apt. Was basically told take to or leave it. The extremely rude reception man offered a small refund and spent the next few days avoiding paying it to me, until I got annoyed with him at reception and he phoned the police who arrived very quickly as I now believe he told them I was threatening him, they were very good about it all and basically told him they were not surprised I was annoyed as he had promised me for days to pay me the money owed..
Room was so poor, windows dangerously unstable, electrics severe, cooker dangerous, no entertainment at all, oh sorry yes a pool table, pool was very unclean too. Please do not even think of staying here, there is so much better on offer, please please just don't even risk it, trust me. We were moved to the Cala d'or Park from Alcudia due to the disgusting apartments we were put in there. When we arrived we were very disappointed as this was not that much better from where we moved from. The apartments are diabolical and are in need of immediate upgrading, they were filthy, bathroom a disgrace, have been to public loos in a better condition. Everything was falling to bits. You could not self cater as not enough space or storage or worktops. Staff not friendly and felt they were doing you a favour if you asked for anything the answer was we don't have to provide you with anything! The 2 weeks we were there did not have clean sheets, bathroom not cleaned and towels twice a week! I could go on and on, bottom line an absolute disgrace!!! I was apprehensive about the hotel when we booked it, and decided to research it on the internet, as I have done for many years now with our holiday destinations. I actually found very little constructive information (from people that had stayed there) other that that offered by companies wishing to sell holidays at the place. Well we have just come back last week from the Cala D'or Apartments and I have to say that I was slightly relieved with what we found. After reading reports on the internet we were really panicking about the apartments as most reports read very badly. Firstly location wise they were ideal - 5 mins from the town centre and 3 mins from the beach. The Apartment itself was quite small - it was a one bedroomed apt but what we didn't know was that they do have 2 bedroomed - we went with Direct Holidays which only advertised 1 b/room. The beds in the living area were actually very comfy but we also hired out a fan with no probs which we had on the whole time we were there. The maids came daily to empty the bins and the towels and bed linen were changed 6 times during our stay! However we did find that we were supposed to sweep the rooms ourselves and they left a brush and pan to do so. I would also recommend that you bring a kettle for handiness. The cooking facilities were adequate although we did not actually use the over or hob. We were situated in the complex over behind the pool which we found quiet and well placed - there were gardens we overlooked from our balcony. However the pool area was very crowded and you needed to be down at 8.30 to get a bed. Kids over run the pool and I do have to say that the parents didn't seem to give a dam what their kids got up to - we have 2 of our own and I was for ever on their backs about splashing etc as people had to sit so near the edge of the pool that they were always getting wet. When the pool was quiet it was great and there was plenty of entertainment at night and during the day for kids and family. The crazy golf area could do with a little updating but it was useable. The 2 entertainers kepts the kids busy and really did put a lot of effort into their daily programme although it did become somewhat tiresome after a while, but the kids all thoroughly enjoyed it and if they are happy then that can be a blessing. There was a kids disco every night at 9 and then family entertainment at 10. I will say that there was some complaints about some of the rooms being really run down but there never seemed to be a problem about getting moved. The owner actually arrived the day before we left so perhaps someone had made a request to speak to him. In all I was relieved when we got there but perhaps we were lucky. The staff were very helpful and one of our maids was infact english. Hope this has been of some help to others. This was one of our most favorite holidays, our apartments were basic but very clean and we enjoyed, crazy golf ran all between the apartment terraces, we never actually used pool so cant comment.